Definition at line 161 of file md4.c. Definition at line 165 of file md4.c. Definition at line 162 of file md4.c. Definition at line 169 of file md4.c. Definition at line 163 of file md4.c. Definition at line 173 of file md4.c. Definition at line 159 of file md4.c. Definition at line 113 of file md4.c. Referenced by finalize_hash_impl(), KsecGatherEntropyData(), SECUR32_CreateNTLM1SessionKey(), SystemFunction007(), and SystemFunction010(). Definition at line 45 of file md4.c. Referenced by init_hash_impl(), KsecGatherEntropyData(), SECUR32_CreateNTLM1SessionKey(), SystemFunction007(), and SystemFunction010(). Definition at line 181 of file md4.c. 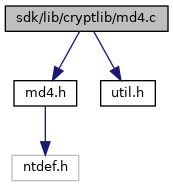 Referenced by MD4Final(), and MD4Update(). Definition at line 59 of file md4.c. Referenced by KsecGatherEntropyData(), SECUR32_CreateNTLM1SessionKey(), SystemFunction007(), SystemFunction010(), and update_hash_impl().